Astrophysicist, StarTalk host, and self-proclaimed sci-fi geek Neil deGrasse Tyson hosts a round table talking about the science behind the science-fiction in GE Podcast Theater’s LifeAfter. Joining him are computer scientist and humanity-centered robotics expert, Michael Littman; leading software research expert Colin Parris; and the show’s writer, Mac Rogers. Let the tech geeking begin. Neil deGrasse Tyson Promos "After LifeAfter"
New messages are starting to pop up all around the world that have one very odd thing in common – the people who are talking are no longer alive. But in an age where so much of our lives are recorded, posted, and saved, can we ever really die? If you live online, where do you spend eternity? 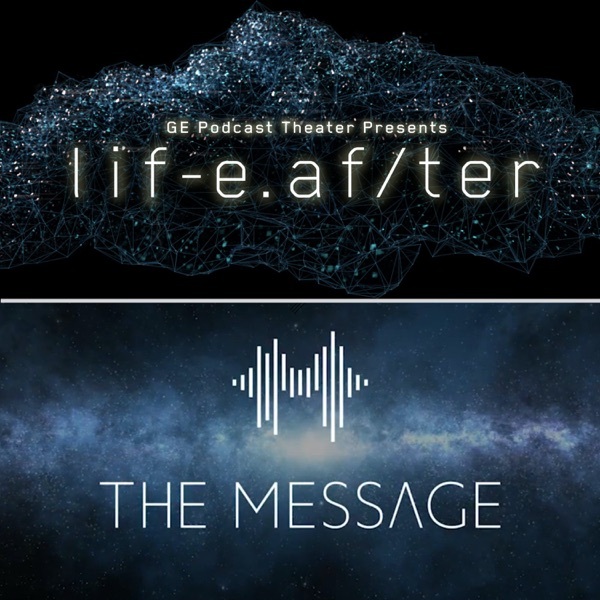 Tune in to learn about an all new series from GE Podcast Theater, LifeAfter. New episodes every Sunday. The group creates a plan that will help them find an answer, but puts a team member's life in greater danger. Even at the expense of their team, they continue pushing their plan further to solve the mystery of The Message. With three members of the team now in critical condition, the group and Dr. Kalpana must use the remainder of their manpower to find an answer. They begin to see patterns among their ill team members that can help them decode The Message. The group’s relationship with Nicky continues to be tested. With two ill members and sudden quarantine, the group realizes they must find answers before it’s too late. An unexpected visitor from GE breaks into their building to help the group. Another member falls unexpectedly ill.
New findings about Nicky’s past surface and leave the group, especially Robin, further questioning her character. Another member’s life is put in danger. The group is quarantined by a medical unit and patrol officers. With Tamara gone, the group reevaluates their strategy and tries to cope with the recent turn of events. New information surfaces that alters Nicky’s relationship with the group.